What are your fondest memories of traveling by train? I am sure there are many. As a kid, it would have been the excitement of getting the window seat to look out at the passing scenery, the goodies that your parents bought for you at every station, the thrill of seeing new places, as well as the toys and souvenirs sold by vendors inside the train as it lugged towards your vacation place. As you grew up, a few things from the above list may have changed, but I am sure many of you would still love to have that window seat to look at places that rush by as the train travels to your destination. 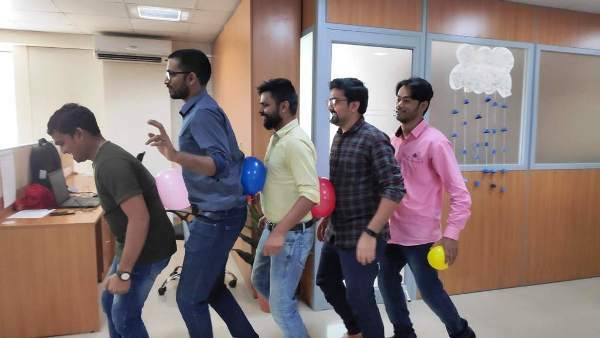 We too have very fond memories of a recently conducted trip at work in a special kind of train as a part of the Continuous Learning sessions that we have every week. We enjoyed the ride – thoroughly. It also brought back memories our time as children when we made lined up behind each other to play “train-train” and stopped at some hypothetical station for the passengers to get on and off. So the Station Master, as I would prefer to call her, was Mona Bharadwaj, our HR. An extrovert by nature, she loves to travel (well, that was obvious, isn’t it from the game that she chose to lead :), dance and watch movies. Mona also has a philosophical side to her – she loves to write quotes from the lessons she learns in her course of daily life (something that she attributes to her being emotional but at the same time a quick learner who lives every moment with joy). Wow! That is such a positive side to her – something that we have always noticed at work. Mona introduced us to this game called “The Balloon Wagon” – the special train in which we were about to go for a ride. So it was decided that there would be two trains (one was not enough for all of us). And each train – I mean, the team would race against the other in a unique way. So we teamed up to make up coaches – members per team. There were conditions to be a part of the train. There were also pre-defined boundaries which I prefer to call as stations. A station called start line and another called end line. And there were props as well – deflated balloons that were kept at the end line for the team members to inflate at a certain point of their game. The game started on an easy note. The first member had to run from the start line to the end line, pick up a balloon, inflate it and run back to the start line where the #2 member will be waiting to join the train. Now #1 and #2 will hold this inflated balloon between them (with no hand support) and run back to the end line where #2 will pick up a new balloon, inflate it and #1 and #2 will carry it back to the start line, holding the 1st balloon between them and the 2nd balloon in #2’s hands. At the start line, a new member will join them and this game will continue till all the 5 members are holding 4 balloons between them and the last one in the #5’s hand. At no point during the game the team members can support the balloons between them with their hands nor should they let it fall. God forbid if either of these things happened – it was back to the start line. Once a team was done, it was the next team’s chance to play the game. The team that completed the game in the shortest time won. As the Station Master flagged us at the station at the end of the journey, there were winners – team #2 won the race and the game. Avinash Pritam, Bhanu, Sachin, and Jahir were the coaches of this Balloon Wagon. It was a fun game that taught us about team building first and team bonding later. Team building as in how each individual played a key role in getting to the end line. 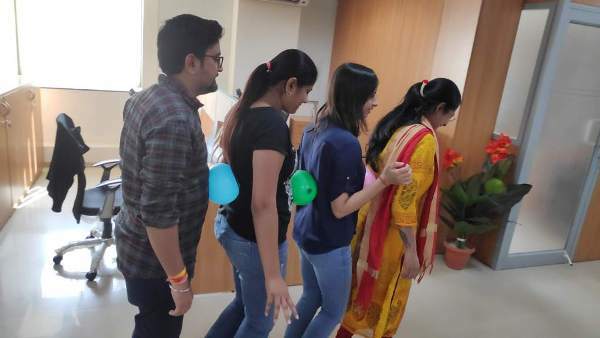 The balloon taught us about the team bonding part – about how sometimes, something as flimsy and delicate as a balloon is enough to keep the team bonded on a project to get to the target and make things happen. So yeah, as Mona is bound to tell you – situations may not always work in our favor and we may not always have everything to our liking, but by being positive we can make the best of a difficult situation turn in our favor. That’s how a team should be always.